One of the most requested styles for Mother-of-the-Bride dresses around here is a Mother-of-the-Bride dress with sleeves! And one the top color requests we see is for silver or gray mother of the bride dresses. So today, I’ve decided to put these two popular requests together into one collage! I have also included a shopping section below dedicated to Silver Mother-of-the-Bride dresses most with short sleeves, long sleeves, jackets and 3/4 sleeves! As you can see, an embellished silver dress is a cinch to add accessories to! Just stick with silver, crystal, gunmetal, diamond or other silver tone accessories. The embellished top of this gown is so lovely, it just amplifies any sparkling accessories you may wish to add! 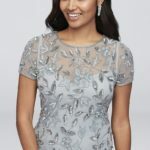 If this isn’t quite the dress you’re after, see the shop section below with more silver and gray dresses that are suited to Mothers-of-the-Bride and Mothers-of-the-Groom as well as wedding guests! David’s Bridal – I look here when I want dresses that are perfectly suited for a wedding, and have excellent reviews! There is also a great range of colors, silhouettes, fits, and styles you won’t see other places! Dillard’s – another astounding selection (especially online!) of special occasion gowns! Teri Jon – the chicest Mother of the BRide dresses I have ever seen with impeccable fit and quality! 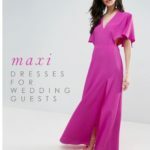 BHLDN – a boutique-like selection of beautiful mother of the bride dresses! Also follow us on Facebook, Instagram and Pinterest boards for more Mother of the Bride and wedding styling ideas!